Every time I turn on the evening news lately I hear about how serious this flu season has been. And they’re not kidding! It breaks my heart that it has now taken 30 kids from us, and that’s straight from the CDC this winter. This year’s virus is called H3N2 and is particularly tough on young children and your older loved ones. My first thought as I investigated all these tragic reports was, “Is this preventable?”. There should be no reason that a family goes through this kind of misery when simple preventative measures could go a long way. I wanted to share with you my health tips for this 2018 flu season to keep you and your family safe and then you must read on about my amazing 3 step illness prevention solution to protect your family from this horrible flu season. If a loved one experiences a fever, chills, cough, sore throat, or fatigue over multiple days please help them get attention. Drinking fluids and getting rest, it’s always wise to seek medical help. One of my favorite ways to help my family sleep during cold season is diffusing my Blend Immunity Blend. A young Connecticut boy experienced serious health issues when his pneumonia was met with the flu and the same for a young girl in California. Sadly her flu was worsened by a strep infection in her blood, and before her family knew it – it was too late. My method for avoiding complications is my antibacterial cleaning solution. It’s the only way to protect your house from everything trying to attack your home and family. While it may seem obvious to some, we need to do what our mom’s told us since we were little kiddies. This includes (**cue mom voice**), washing your hands, staying away from those who are sick (if you can), eating a healthy balanced diet, and drinking plenty of fluids for starters. Essential oils may not be able to help you with your balanced diet, but highly recommend using a topical application of immune boosting oils. 4. Give your body time to do its magic! Step #1 I have my family apply Blend’s Immunity Roll-On directly to their skin. My kids need a protective barrier with all the shenanigans they get into. Whether it’s in the crowded cafeteria, in our neighborhood carpool, or just at soccer practice I know they come home they need a fresh, clean environment to get the TLC they need. I simply use Blend’s pre-diluted immunity roll-on bottle (so it’s safe to apply directly to the skin) that makes it super simple to apply this oil to your kids. When my kids are not feeling well I usually apply it 3-5 times a day to their wrist and chest. Step #2 – I purifying the air. If I can stress any of the steps, it’s this one. So listen up! Diffusing my essential oils in the air is the clincher in keeping my home sniffle-free and healthy. So many of these germs, bacteria and bugs are airborne and what works wonders is using my diffusers (yes I have multiple running this time of year). For those of you who haven’t used them, I first place water up to the “fill” or “max” line, which can be hidden so give it a long look, AND then I put 5-10 drops of Blend’s Immunity Blend. It’s that simple and that fool-proof. During the height of the sniffle season I have a diffuser in our family room and in our kitchen that works overtime to keep everyone happy and healthy! Step #3 – Use Blend’s specially formulated all natural cleaner. I hate nasty chemical cleaners! They have that harsh chemical feel that seems like it should be paired with one of those big yellow hazmat suits rather than safely applied around your home. To defend and protect my home during flu season I use Blend’s Cleaning Concentrate. It not only uses powerful citrus oils but it includes an incredible colloidal silver twist. If you didn’t know, colloidal silver is an all natural bacteria killer and is commonly used in hospitals to fight infections within burn trauma units. You should definitely put that kind of high powered protective services at work by spraying those high-traffic areas in my house – think the front door/mudroom, the bannister and stairs, especially our kitchen counters, and of course your bathrooms. Just a few sprays and then wiping down the area does the trick in adding that extra layer of defense I seriously need during flu season. For me the proof is in the way my kids feel and my family being safe no matter what everyone at school might be coming down with. But to be clear, I did a bit of searching about essential oils (probably because I had more time now that my family wasn’t sick all the time) and found out that plenty of other countries use essential oils for medicinal purposes. For example, in Japan essential oils are used regularly and you’d probably be shocked to find out that Japan has nearly 50,000 people currently living over the age of 100. That’s almost as much as the US but they’re one-third our size. Seems like they’ve got something in healthcare figured out! 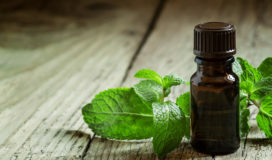 Here is what makes essential oils so special – Essential oils are the highly concentrated essence of plants. Plants are earth’s readily available source of antioxidants, antimicrobial, vitamins & minerals, phytonutrients and much much more. Scientists have become experts at generating super concentrated, highly potent, powerhouse drops of oil.